The Portal shirt Ben Heck built last year is now up for grabs on eBay, with all proceeds going to the AbleGamers Foundation. Do you remember the Portal t-shirt that hardware hacker extraordinaire Ben Heck built last year? You should, because it was freakin' awesome. 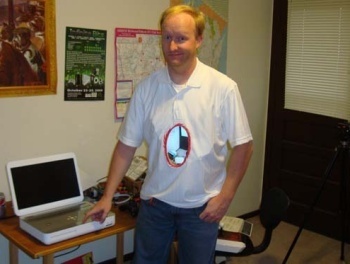 By combining an LCD screen, a rear-facing camera, a battery pack and a couple of crappy t-shirts, Heck was able to come up with a Halloween costume that you can literally see right through. And now it can be yours! The one-of-a-kind shirt, autographed by Heck, is now being auctioned on eBay, with all money raised going to the AbleGamers Foundation, an organization dedicated to the support and assistance of disabled gamers. "The AbleGamers Foundation serves anyone in need through direct person-to-person services, assistive technology grants, community support, and access to data," the eBay listing says. "We help people afford expensive technology, which allows them the ability to participate in gaming experiences that improve their overall quality of life." It's a sweet prize but you're going to have to be dedicated and deep-pocketed if you want to bring it home. At last check, with just under seven days remaining, the bidding on Ben Heck's Portal t-shirt had reached $610.00 - cake not included.